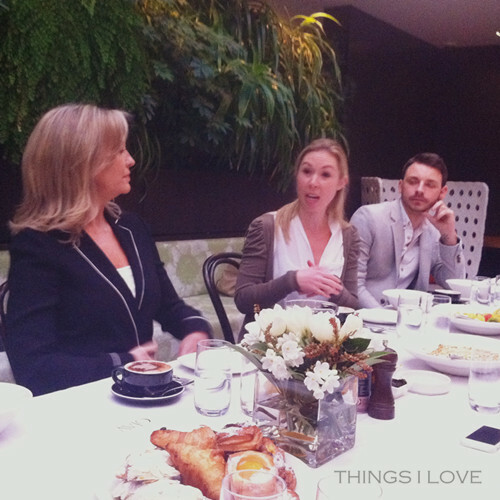 Last month, I had the pleasure of catching up with Rebecca Gibney over a bloggers breakfast event at the beautiful surrounds of the Botanical in South Yarra. Now I’ve been a long time fan of Ms Gibney during her acting days at Halifax f.p and even more so with her as Julie Rafter in Packed to the Rafters. So you can imagine my excitement when I got to meet her in the flesh and not only that but, enjoy a meal together as well as part of an Olay Regenerist bloggers event. It was truly a star struck moment. In person, Rebecca is as beautiful as she is on set. Not only that, she is unbelievably affable, warm and friendly - it felt like we were speaking with a girlfriend on the morning, sharing stories about kids, chatting about our favourite makeup products and giving each other skin care tips over a delicious spread of croissants, fruits, smoked salmon and eggs Benedict. During the event, Rebecca spoke of her long time love of Olay products (especially the new cleansing system facial brush reviewed here) and why it was a natural fit for her to be their ambassador since she has been using their moisturisers since her early 20s. If it is good enough for Rebecca Gibney, it’s good enough for me as I’ve just embarked on the 4 week challenge with the new Olay Regenerist Moisturising cream and will be giving a review one the 4 weeks is up. TIL: Now that you’re finished with Packed to the Rafter, what’s your next project? Rebecca: I’m currently developing a couple of shows but hopefully I will be shooting one in the next few months to be on air early next year. And of course I’m loving being the Olay Regenerist Ambassador. It’s fantastic to be able to talk about a product that you are passionate about and it’s a brand I have used on and off for over thirty years. I’m currently working on some projects with Channel 7 which I can’t reveal right now and I’ve also just shot a factual show in New Zealand which will be on in 2014. I’ve also been developing some projects with my husband for our company R&R Productions. Being a beauty blogger, I’m interested in finding out about your beauty rituals. Can you tell us what your morning and night time skincare routines are? I start off with my favourite new product the Olay Regenerist Advanced Cleansing System – it’s seriously amazing. I’m obsessed. It’s like a daily mini facial. I don’t like to wear a lot of make up in the day so I keep it light – a sheer foundation, a touch of mascara and a subtle lip. Cleanse with Olay Regenerist Advanced Cleansing System- did I mention I’m obsessed? Finishing the day off with my Olay Regenerist Micro-Sculpting Cream. TIL:Do you carry a makeup bag with you whenever you’re out? Can you share with us what’s in your bag? TIL: What’s the most your favourite makeup product and skincare product and why? Rebecca: I would have to say the Olay Regenerist Micro Sculpting Cream SPF30. I wear it daily and can’t stress enough the importance of an SPF product (especially on a desert island). That and a good lip balm! TIL: Do you have any advice or tips do you have on how to achieve/maintain youthful and radiance skin for older skin? (my mum is hanging out for your words as she said you look so young in our photo together during the Olay breakfast event). Rebecca: Doing it joyfully. DO it with optimism and you will always look better with a smile on your face. I’m a big believer that beauty comes from within. If you look after yourself on the inside then the outside should fall into place. I try and take care of myself with a fairly healthy diet (although I still like a glass of wine and dark chocolate) Moderation is the key. Moderate exercise as well – I’m no gym junkie. And a genuine smile. I’m a very optimistic person. Things will always get better - even your skin if you look after it! - Great skincare also helps. Of course, I couldn't have breakfast without having a photo taken with my idol on the day and I would like to thank Rebecca for taking the time to respond to my question. My brief interaction with her has just further cemented my idolisation of her and yes, I'm still gushing and semi-star struck a month later.